« We’ve lost count of the number of times we’ve hidden Elvis! 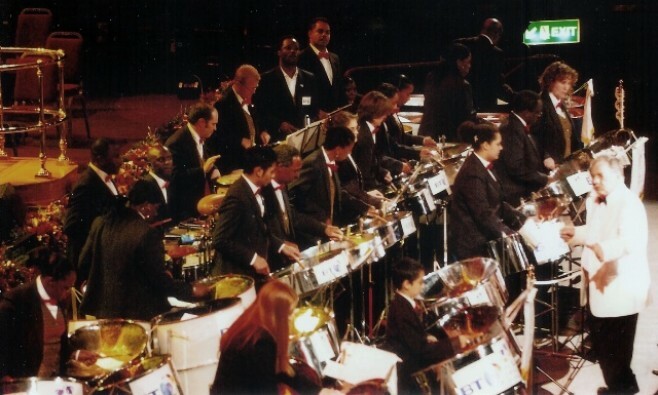 Steelpan “ambassador” Terry Noel, set up the orchestra, the BT Melodians 23 years ago. Since then the orchestra has played all over the world, frequently for high-ranking dignitaries (QE2 for example! ), prime ministers, at embassies and for the public too. In the summer the Melodians engagement’s included playing a concert with an army band, at Kneller Hall in Twickenham, the home to the Royal Military School of Music. Tonight the orchestra was performing for the Mayor of Lambeth, The Chief Inspector of the Crown Prosecution Service, The High Commissioner for Trinidad and Tobago and me, oh yes, and other people too! It was the annual awards concert and prize giving. With everyone rehearsing twice a week, the players in this 30-piece orchestra certainly deserve their accolades. The Melodians have a large and varied repertoire so could be considered for year-round entertainment and not just summer events. They’ve a great mix of classical and more contemporary tunes too. You can book a smaller version of the orchestra – a minimum of six players – not everyone has the space, or budget, to accommodate 30 performers with nearly 60 pans, drums and percussion! A truly splendid evening and well done to Sarah – most improved player; Molly – most promising player; best attendance – Richard and player of the year – Nicole. But as Karen said, on behalf of the orchestra, biggest thanks must go to Terry for his inspiration and 23 years of dedication – go Terry! I’m sure we’ll be seeing the BT Melodians at the 2012 Olympics but if you’d like to book them before that please let me know! BT Melodians, you rock! This entry was posted on December 13, 2010 at 11:40 pm and is filed under Steel Bands and orchestras for hire. You can follow any responses to this entry through the RSS 2.0 feed. You can leave a response, or trackback from your own site.